You are currently browsing the tag archive for the ‘Lexi Erickson’ tag. I am a firm believer in investing in quality. That is one of the reasons that I buy the majority of my stones from Gary B Wilson. Personally, I think he is one of the top lapidary artists (i.e. stone cutters) in the country. Those of you who follow my blog know that I am going through a period in my life where I am dealing with the loss of a beloved companion, Bueller. My dear sister, Lexi, wanted me to have a girls day out and just have some fun. And so we did. Yesterday, we went to the Rocky Mountain Bead Society Show at the Denver Merchandise Mart. Lex had some of her students join us, and I was greeted by some of my artistic friends, Nancy Bonig and Ginny Maiolo. It turned out to be a “Chicken Soup for my Soul” day. Thank you Lex. When the doors opened at 10:00 AM, everyone headed to their favorite vendor. 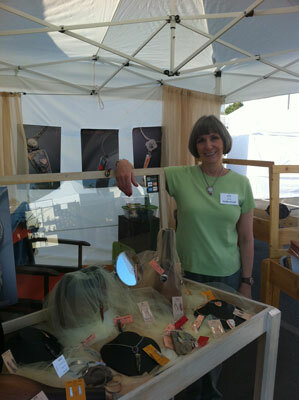 Gary’s booth was swamped with many of us in search for those treasures that will find their way into our future works. I found trays with some of my long standing favorites, Willow Creek Jasper, Imperial Jasper, Porcelain Jasper and Tiffany Stone. This time, I found some new beauties in Burro Creek Jasper that I believe will find their way into my Treescape series. 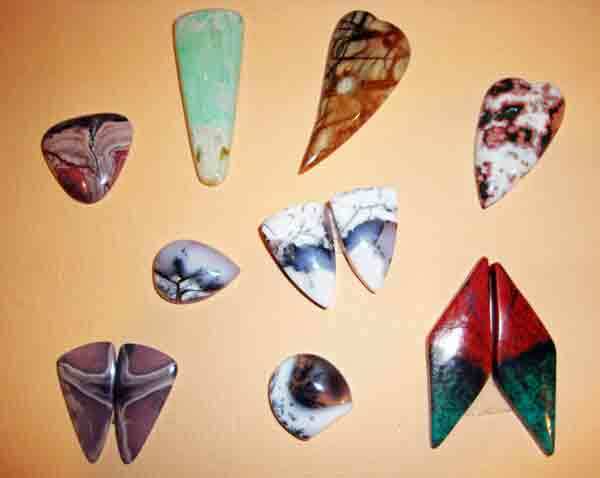 The picture shows all of those mentioned plus some Mookite and Bloodstone. Today I’ve been sketching new designs; my future works are starting to come to life. May all of you have a wonderfully creative day and week. I’m heading back into the studio to work on some new diversions. Blog-o-Sphere Think Tank ~ Who has had the greatest influence in your life? February’s topic from our Blog-o-Sphere Think Tank is Who has had the greatest influence in your life? Profound. I’m pretty sure I have a top 10, probably a top 5 that are the superstars for me. All are important and I am grateful for their influence. The ones I mention in the post are in no particular order; each one has touched my life in their own unique way. Definitely my parents were a huge influence in my life. How could they not? My mom raised me to be a strong, independent woman. Instilling the belief that there wasn’t anything I couldn’t do if I put my mind to it and worked hard. My dad, for never limiting me because I was a girl. If I wanted to learn about a car engine, he happily described the parts and mechanics. Both of them ingrained in my personality the importance of a strong work ethic, by their actions and their words. I have to give kudos to the many teachers who challenged & encouraged me. One who had the greatest impact was Mr Martin, my 9th grade Algebra teacher. I still remember the first day of his class. He told us everyone could be good at math and he expected all of us to raise our hands to answer questions. It became one of the most exhilarating classes I had that year and led to my love of math. That was the first year I got straight As. I think the overachiever in me grew and thrived on the rewards of studying. There’s been a variety of personalities, that I have never met, but admired. Kate Hepburn. Her fierce independence and wonderful sense of style. I’ve started to read one of her autobiographies and have been fascinated by the public persona she developed and groomed vs. the private soul only intimates knew. Another is Steve Jobs. His brilliance and creative spirit have given the world such intelligent devices that make my life so much easier. Then there is my sister, Lexi Erickson. She too falls into the category of those great teachers in my life, but there’s more than that, it’s that bond we share. I couldn’t leave this topic without including my soul mate, Dan. His influence is great. A kind gentle spirit with wisdom beyond his years. He is my rock and keeps me centered. There you have it. I couldn’t name just one as the greatest influence in my life. I guess that just confirms that we are the sum of the parts. I am a composite of all I have seen, heard and done. I think that’s wonderful. I know that I will continue to grow and be influenced by many individuals….awesome. Blog-o-Sphere Think Tank ~ What are you Thankful for? I find this topic timely and one I feel I could write volumes about. I’ll try to condense it to a Reader’s Digest version that will hopefully be succinct. One thing I am most thankful for in my life is my husband, Dan. He helps me in more ways that he may even realize. His love, encouragement and support, along with being my BFF, well, it just doesn’t get any better than that! I love you Dan; thank you for being the calming, centering force in my life. 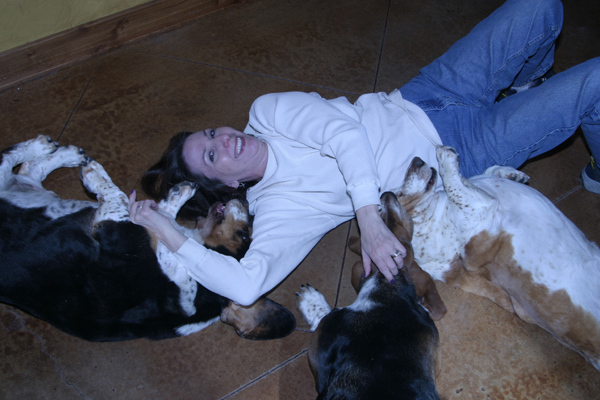 Our bassets are another aspect of my life for which I am very grateful to have. They are great companions and their antics are constant sources of humor, every day. It’s hard to stay glum when one is greeted with happy tail wags and kisses. I feel I have received more blessings than I can count. My intellect. The ability to be creative. Supportive friends. My dear sister, Lexi. My health. Along with a good sense of humor; I definitely believe in being able to laugh at myself! This past year as Lexi and I worked our way through a couple of books, The Simple Abundance and The Artist’s Way, I think that helped to provide an even greater awareness of all of the people and things I am truly grateful for. My heartfelt thanks to all. Now let’s see what the rest of these Blog-o-Sphere Think Tankers shared! The photo at the top of this post are a few of the treasures I purchased last week while at the Denver Gem & Mineral Show. Some are from Gary B Wilson. 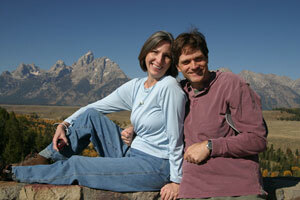 Some are from Mark & Christa Lassater of The Clamshell. I wish that Ken of Rogue Gems would have been there this year as I would love to meet him…I know his work will be a part of my future works too. Last week, I spent a day at the Denver Gem & Mineral Show with Lexi. One of those special times I share with Lexi where our respective creative juices are flowing. Shouts across the booths to each other, come look at this, here is a stone in your color scheme, what do you think of this?, this one is you, you have to get this one….. I think you get the idea. We help each other. We know what each one likes and as we search, we find things that the other may love to incorporate. And then there are a few twists and turns, along with the surprises. It’s a real joy to share the day with Lexi at this show. I knew what I wanted to shop for this year, more so than ever before. I did my best to avoid the distractions. Overall I think I did well. 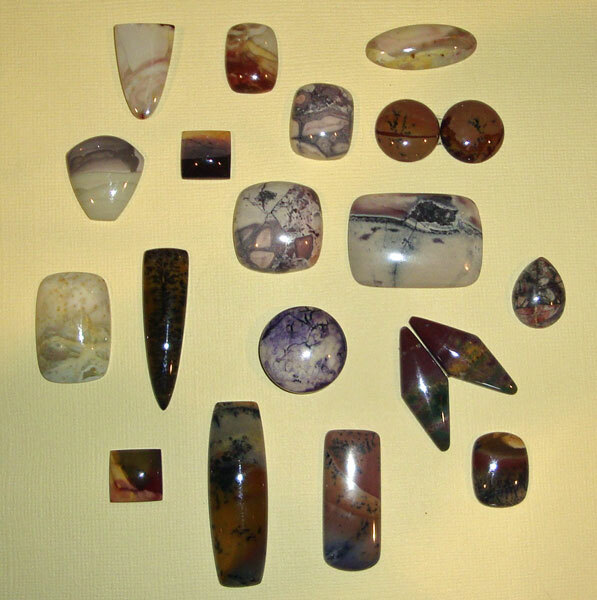 The top photo shows Porcelain Jasper, Dendritic Opals, Sonoran Sunrise, Ocean Jasper and Variscite. 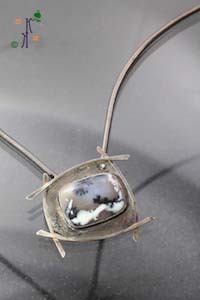 I have a new series in mind thanks to one of these; I’ll start work on it after the Jewelry at the Gardens show. I was on the hunt for hearts. I think I raided Gary B’s supply. There were some lovelies and I wanted to go for the smaller ones based on client’s requests. These are a few of the new ones and I already have designs completed for them; some petrified palm wood, picasso stone and mystery stones. What fun! This weekend will be spent in the studio, working on the hearts that are part of the Veracity series, along with some new additions to Mountainesque. 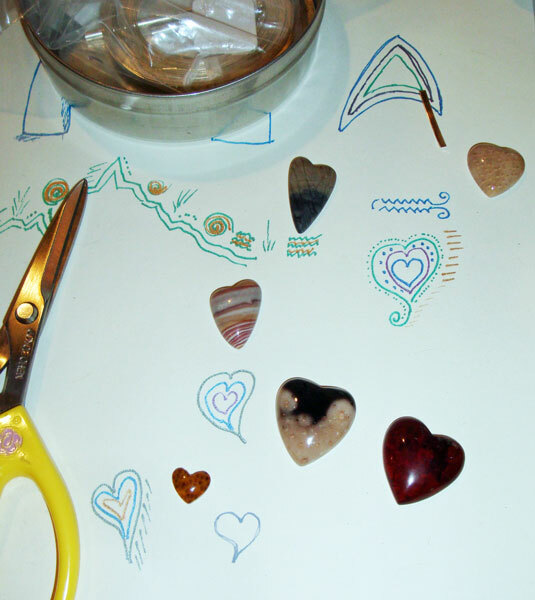 I’m excited, energized to be working with new stones on current series that will be ready for Jewelry at the Gardens. Isn’t that part of what art is all about? The thrill of creating new things? As artists, I think we are always looking for something new & different. I know I am. It was right before the show opened and Lexi took this picture of me with her iPhone. Not bad! Thanks Lex. The weather was perfect. This was my first BIG fine art show, outside, where the elements could be anything from freezing cold to furnace hot. This weekend, the Colorado weather was on its best behavior. The first day, the crowds were relatively light. There was an Air Force Academy game that may have played a factor in the attendance. Sunday, the crowds were better and the people were more engaged in looking at the artists work, talking with us, and enjoying the Art Festival. Ribbons were awarded to artists in various categories. Two of our friends won best in their divisions, Julie Jerman-Melka for Jewelry and an oil painter, Stephen Koury. Lexi and I could not be happier for them….well deserved. I hope you will take a moment to visit their respective websites to see their works….you will see why they won in their categories. This was not the best selling show I have had, yet regardless of that, I came away from the show with so much more than monetary rewards. I was invited to participate in the Holiday Market run by Commonwheel Artists Co-op in Manitou Springs! It is a 6 week event that runs from November 18 – December 31, 2011. I was flattered and accepted the invitation. My Arts & Crafts Impressions series caught their eye so there will be more of those wonderful gingko inspired jewelry pieces in the works. The experience of doing this type of show was invaluable for me. More importantly was the sisterhood that I shared with three very special artists during the show. My sister, Lexi Erickson, of course! Lexi will forever be my mentor; when I need someone to lean on (besides my soul mate Dan) Lexi is there. I am so blessed to have her in my life. Then there is Mary Sharp-Davis, a woman that has so much wisdom and gentleness….everyone should meet and learn from a gentle soul like Mary. And then Julie Jerman-Melka….another woman who mentors, guides and nurtures. Through Lex, I have met and gotten to know Mary & Julie. A wonderful circle of creatives. One cannot ask for anything more, nor feel more blest. I am thankful and grateful for the experience and the wisdom imparted by this gifted women of the sisterhood. Can you believe it’s September? Next weekend is the Castle Rock Art Festival in downtown Castle Rock, Colorado. This will be my first big fine art festival. Lexi generously offered to share her booth with me if we both got juried into the show. Well, Lexi has done the show for the past two years and I had no doubt she would be juried back into the show this year. She was. Lexi’s first year in the show she won Best Fine Crafts. I was less than confident about being accepted into the Artfest, but I submitted photos of my latest works, the Mouontainesque Series, and ponied up…holding my breath…. To my delight and surprise, I received the acceptance notice back in May. There was that feeling of euphoria knowing that my work made it into this show and to be able to do this show with Lexi will be a real joy. There are lots of wonderful artists doing this show. To see the complete list, check the Artfest site here. Lexi & I will be in booth number 152. I will finally meet one of Lexi’s dear friends, Mary Sharp-Davis, whose booth will be next to ours. I have seen Mary’s work and it is just stunning. 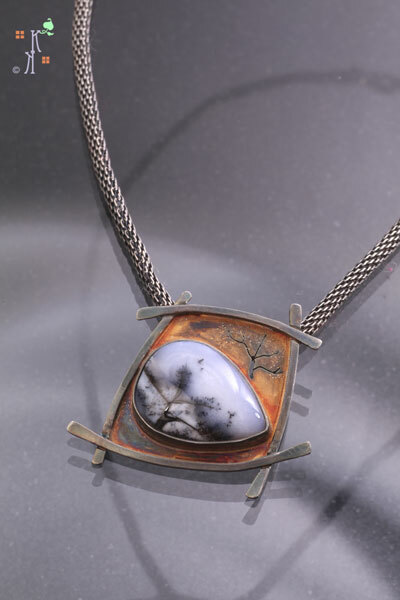 Her work encompasses ceramics and jewelry. I can’t wait. 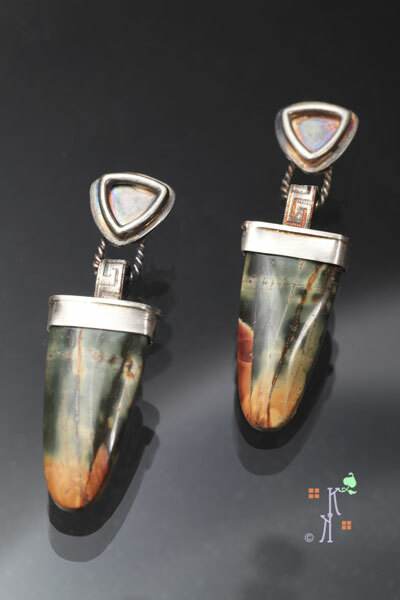 Then there’s our friend Julie Jerman-Melka, another gifted and talented metalsmith, with her beautiful river stone and raw diamond pieces. You can find Julie at booth #98. Lexi will have more of her delightful Shamans inspired by her work as an archeologist. I gotta tell you, these guys truly define art jewelry in my mind. I have two more new series that I will be debuting at this show. Veracity and another that I have called Elements. The show runs from 9 AM – 6 PM on Saturday the 10th, and on Sunday the 11th, the hours are from 9 AM – 5 PM. One of the many things I enjoy about this show, having been an attendee in previous years, is how well-organized it is. There’s plenty of parking at the Douglas County Fairgrounds and the city runs complimentary bus shuttles to the event location on a fairly regular basis. Admission is only $5. There’s something for everyone. Let’s hope that our Colorado weather will be wonderful rather than filled with surprises. If you live in the area, I hope you will stop by. I believe the folks at 3M are pretty darn ingenious. 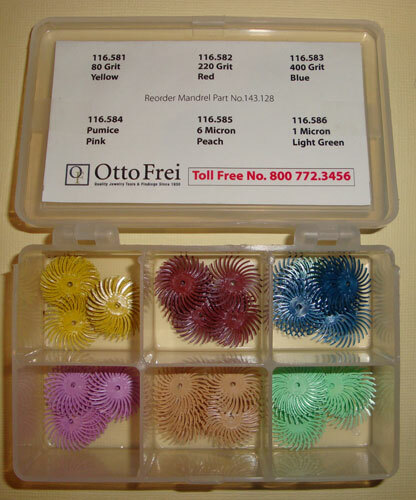 From their sticky pads that came about because of a glue ‘mistake’, to their invisible tape for wrapping presents, to their line of Micron sandpapers, to these little radial bristle discs, and TONS more. I’m definitely a fan of 3M products! For this segment of Talkin’ Tools, I thought I would discuss my affection for using these discs in my metalwork. Lexi introduced them to me and she likes to refer to them as ‘spiders‘ because of their appearance. Initially I had a small subset of 3 different grits. Yes, just like sandpaper, these gems come in different types (grits) for the work to be done. 3M has color coded them according to their grit, which is very convenient. I like to keep a cheat sheet on my peg board to reference which size grit I need, but after a while, you get used to the color coding and I don’t refer to the cheat sheet as much. I find I just use some more than I do others; I gravitate toward the ones that achieve the affect I want in my metalwork. Sometimes I find buying a kit makes a lot of sense. It gives me a chance to see what is in a given product line and helps me to find which ones I tend to use the most. 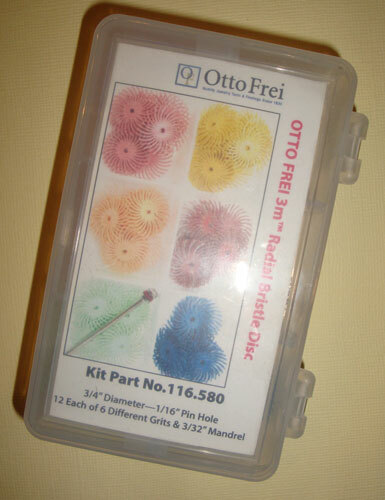 Otto Frei offers this particular kit (pictured above). Of course, once I have narrowed it down to the ones I frequently use, I routinely order those to have a stock pile on hand. I consider these the speed version of sanding by hand. Let’s face it, there are times I need to economize my time and these beauties will cut to the chase for any given metalworking task. They can do things in seconds that will take several minutes or longer if I hand sand the metal. They attach to a mandrel and are used with my Foredom flex shaft. Generally I use a minimum of 3 of the same grit on the mandrel (see the picture below), but you can go up to 6. The white ones (not included in this kit) are my favorite. In this picture I’m showing the size difference between the two types I use. 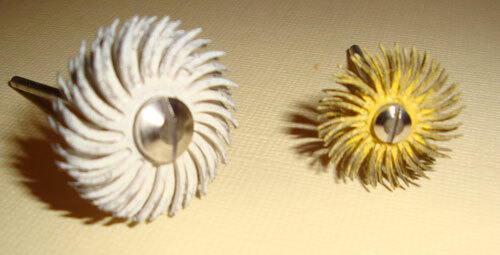 The white one pictured is 1″ in diameter, while the yellow one is 3/4″ in diameter. They are great for getting into small places that can be hard to reach with sandpaper. I don’t try to achieve a high polish with these, I just take them up in size to the smallest micron level depending on the finish I want. The white one gives a nice texture, tooth to the metal finish that will take oxidation well. There are times when I just like the texture the white one leaves on the metal surface and consider that as the finish for a piece. I find them to be very versatile in helping to achieve different finishes. It’s fun to experiment with them. As with any work involving power tools, wear your safety glasses when you use these. The little ‘fingers’ or ‘spider legs‘ do come flying off and I have had them hit me in the face, thus the importance of wearing your safety glasses. They are a great thing to have in your tool box and I use them frequently as I’m finishing my pieces. Oh I still do a lot of hand finishing, but when I need to make quick work of taking off a bit of a solder blob ….well, they are just plain handy. Definitely a plus for my time management in the studio.